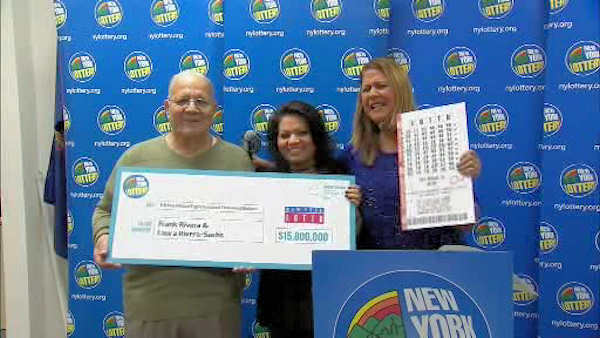 SUFFERN, New York (WABC) -- A father and daughter are New York's newest millionaires. Frank Rivera, of Suffern, and Laura Rivera-Sachs won $15.8 million, and each will take home around $3.8 million after withholdings. Rivera is retired from the New York State Department of Correctional Services, while Rivera-Sachs works as a business analyst with a manufacturing company in New Jersey. "I didn't believe what I was seeing," he said. "I just kept checking the ticket over and over again because I was in disbelief." Then he waited for his daughter, Laura, to come home and asked her to check the ticket. "At first I didn't believe my dad, but then I checked the numbers multiple times and looked at where the winning ticket was purchased," Rivera-Sachs said. "And then I started to believe it was true." In addition to helping his family, Rivera said he plans to buy a new car. "It feels wonderful," he said. "I always wanted to be able to do things for my family, and now I'm able to." Rivera-Sachs said she wants to save for the future and maybe take a family vacation with part of her winnings. "It feels terrific," she said. "This win provides a real sense of security and peace of mind for the future." Ellis Gitlin, from New City, also claimed a $6.5 million jackpot. "I play lottery games every week," he said. "Sometimes I play Mega Millions, but I always buy the lotto game." Gitlin, who is a sales director an instrument manufacturer, was running some errands on December 29, and decided to buy a ticket for the December 31 drawing. Then, on January 2, he scanned the ticket at the Dollar Store on North Main Street. "The display said 'big winner,' and I wasn't sure what that meant, so I handed the ticket to the clerk to check it," he said. "I asked him to print out the numbers for me, and that's when he told me that I hit the big one. I was in complete disbelief." Gatlin too the lump sum payment and will receive nearly $3 million. "I can't get over it," he said. "I don't feel any differently, and I hope that doesn't change." Gitlin said his plans for the money include helping his children, investing for the future, and perhaps taking a vacation to Europe.